Request a quote for a bulk order for Ty1 monoclonal antibody. Please fill out the form here below. Your local sales account manager will get in touch with you shortly and send you a quotation based on your requirements. Monoclonal antibody raised in mouse against the Ty1 tag (amino acid sequence EVHTNQDPLD). 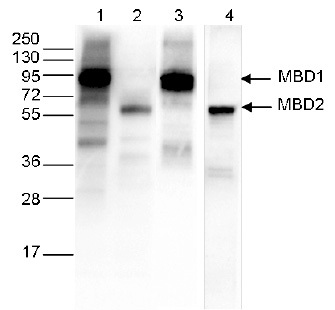 Western blot was performed on 40 μg whole cell extracts from HeLa cells transfected with either Ty1-tagged MBD1 (lanes 1 and 3) or Ty1-tagged MBD2 (lane 2 and 4). The WB was performed with the Diagenode antibody against the Ty1 tag (Cat. No. C15200054) diluted 1:1,000 in TBS-Tween containing 5% skimmed milk (lane 1 and 2) or with an MBD1 antibody (C15410078, lane 3) or an MBD2 antibody (C15410312, lane 4). The position of the Ty1-tagged MBD1 and Ty1-tagged MBD2 are shown on the right, the marker (in kDa) is shown on the left. Diagenode strongly recommends using this:	Ty1 monoclonal antibody (Diagenode Cat# C15200054 Lot# 006). Click here to copy to clipboard. Novel dual regulators of Pseudomonas aeruginosa essential for productive biofilms and virulence. TAL effector-mediated genome visualization (TGV). Utx is required for proper induction of ectoderm and mesoderm during differentiation of embryonic stem cells. The N-terminal segment of Plasmodium falciparum SURFIN(4.1) is required for its trafficking to the red blood cell cytosol through the endoplasmic reticulum. The Human EKC/KEOPS Complex Is Recruited to Cullin2 Ubiquitin Ligases by the Human Tumour Antigen PRAME. An essential novel component of the non-canonical mitochondrial outer membrane protein import system of trypanosomatids. Pusnik M, Mani J, Schmidt O, Niemann M, Oeljeklaus S, Schnarwiler F, Warscheid B, Lithgow T, Meisinger C, Schneider A. Selective autophagy regulates insertional mutagenesis by the Ty1 retrotransposon in Saccharomyces cerevisiae.